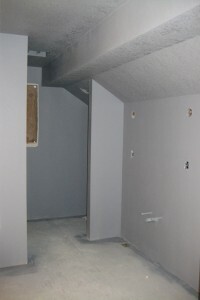 We have finished drywall and interior paint and are excited to see the cabinets on Monday. 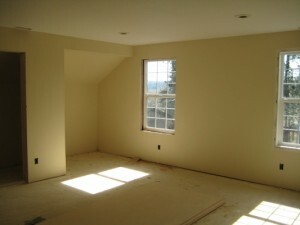 With the drywall complete the rooms are better defined and the homeowners are able to get a better feel for their spaces. The paint colors throughout the house play off each other nicely and when the white trim goes up the effect will be simple but lovely. 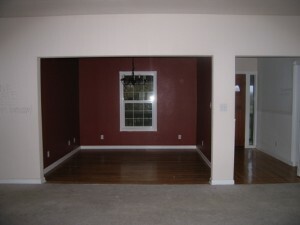 Below are some before and current photos of the home. 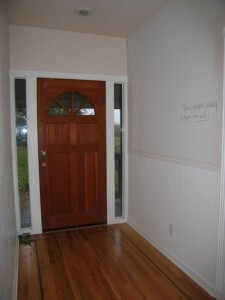 This is the new, gorgeous front door. 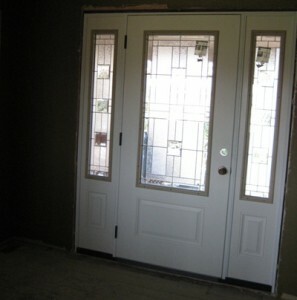 By enlarging the entry we were able to add a larger, more substantial front door. 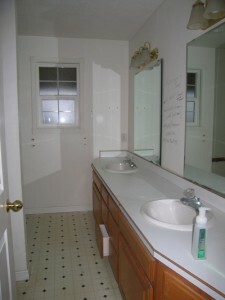 You can’t tell it from the picture, but the ¾ lite in the door added a lot of natural light to the space. 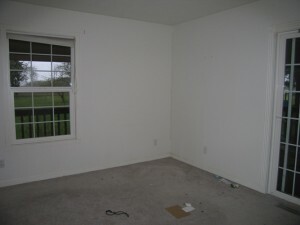 Here’s the master bedroom suite. We were able to enlarge the master bedroom by combining the two small, unused, bedrooms next to the original master suite. This provided the homeowners with enough room for a sitting area and built-ins in their bedroom, a larger walk-in closet, and a proper master bath’s jetted tub and all. 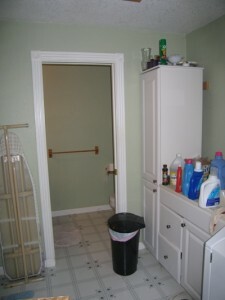 To help orientate yourself, the corner in the before picture is the corner where the jetted tub now sits. 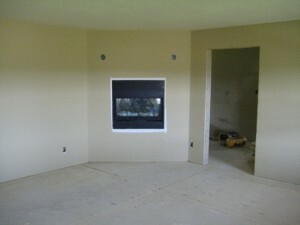 To keep the house’s curb appeal we added two windows in the relocated laundry room. Not only will these windows be an aesthetic benefit but they will also provide ventilation and give the room some natural light during the day time. The white rectangle you see in the during photo below is the location for the future recessed ironing board. That will be one less thing to trip over! 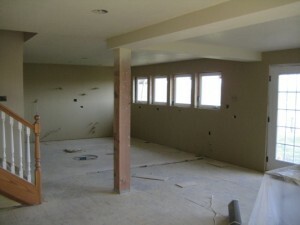 The shot below is taken from the family room into the dining room and kitchen. We have designed white beadboard cabinets in the kitchen and dining room with a furniture-like wood island for the centerpiece. We are all excited for Monday, the day the cabinets will be delivered! 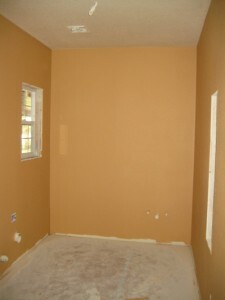 The homeowners wanted a guest bedroom and needed another room for their youngest, who still lives with them. 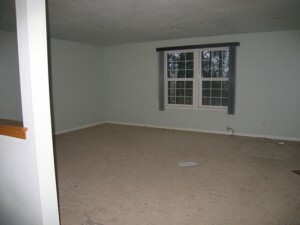 To do this we turned the large bonus room into a bedroom and added a bathroom that has a private access and another access from the hallway. Who couldn’t use another bathroom? It will take a week and a half to install all of the cabinets but we will keep you updated on their progress. 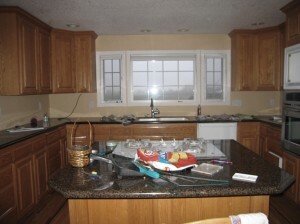 There are several different types of wood we are using for the cabinets throughout this project and we will go into some detail regarding the pros and cons of each once we get some pictures of them. Stay tuned for Cabinetry Woods 101.